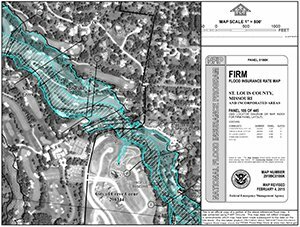 FIRM is an acronym for Flood Insurance Rate Map. A FIRM is used by a multitude of professions who can benefit from the information that the map provides. Those who use FIRMs include professional Land Surveyors, Engineers, Insurance Agents, Community Officials, and individuals in the Mortgage Industry. The FIRM provides information regarding communities, the land located within those communities, and where the areas occur in which there is a risk of being flooded. There are six main items contained in a FIRM. Here are the first three to become familiar with that will help you fully understand a Flood Insurance Rate Map. Physical Features. Similar to a standard map, you will find items such as roads, railroads, lakes, and waterways. The Federal Emergency Management Agency (FEMA) is in a constant state of updating, and many of the maps now include aerial overlays as well. Legend. The Legend provides a key to the symbols and line types found on the FIRM. It also includes definitions for the flood zones. Benchmarks. These are known points of elevation as determined by FEMA. These marks are used by professional Land Surveyors and Engineers to determine the height above sea level of a given property based on the elevation of the benchmark.